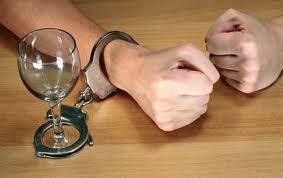 How to cope with alcohol addiction, how to get rid of this condition and eliminate its causes? How to prevent it? These are questions that can be answered by specialists of our Clinic in Moscow, specialists, practicing Doctor Jacob Hiller’s method. and other absurd statements about this disease. Many people think so. But 20 years ago Dr.Jacob Hiller from Switzerland created the unique system for treatment of different addictions and he proved to all medical community that alcoholism treatment is not a myth but a reality confirmed by unchallengeable facts. Tens of thousands of seriously ill patients from many countries returned to active productive life. 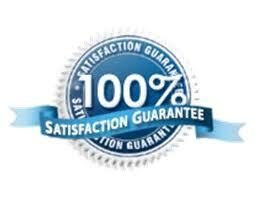 Doctor Hiller’s method is a treatment of alcohol addiction with principally new approach. Dr.Hiller’s alcoholism treatment method is aimed at elimination of abstinence, desire to drink, craving for alcohol using medicines. Thus, our alcoholism treatment method normalizes patient’s mental condition and returns disturbed biochemical processes to norm. For this purpose, first of all, we use the combination of two well-known preparations used during the first 1.5-2 hours. That is we apply medicamental alcoholism treatment method. During this time the patient is completely free of withdrawal abstinence syndrome and there is no necessity to drink alcohol. Such need disappears completely. After that the supporting therapy is administered. This is the next stage of our alcoholism treatmentmethod. It is aimed at normalization of all available biochemical disorders in the central nervous system. Pharmaceutical drugs which we use in “Dr.Jacob Hiller’s Clinic” are produced by the best European pharmaceutical companies and they are certainly approved in Russia. Drugs are provided to patients who need alcoholism treatment in original packages with detailed administration instructions. Dr.Hiller has worked out that the long alcohol abuse results in multiple biochemical disorders in the brain, accumulation of glutamate and N-methyl-D-aspartate in particular and quantitative imbalance of other most important neurotransmitters, substances required for your nervous system to transfer nerve impulse. These are the disorders that should be eliminated for effective alcoholism treatment. 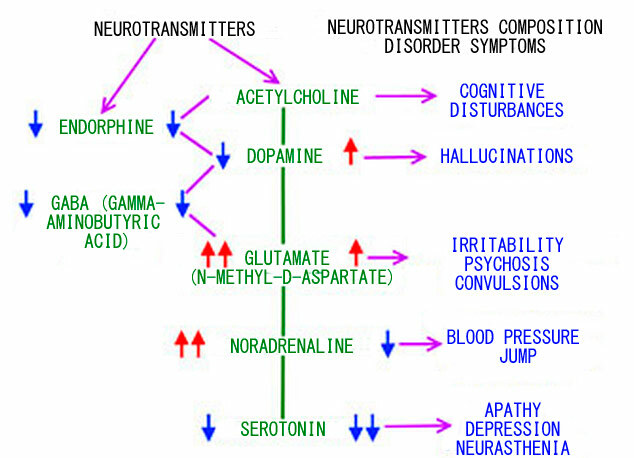 The general background of biochemical disorders upon alcoholism is the following one: the level of neurotransmitters inhibiting impact on central nervous system is reduced, and the level of glutamate (N-methyl-aspartate) causing overstress of certain nerve centers, on the contrary, is steadily increased. This is expressed in anxiety, uneasiness, emotional instability, invariable behavior, aggression and so on. The scheme below shows the disorders of neurotransmitters’ composition which correspond to the specific alcoholism symptoms. The glutamate (N-methyl-aspartate) level which is steadily increased and at which our alcoholism treatment method is primarily aimed, drives the need in increasing alcohol doses as ethanol and some of its metabolism products have affinity (general peculiarities of molecular structure) to the same receptor sites as glutamate (N-methyl-aspartate). Thus alcoholic beverage use becomes the only possible “physiologic” and unfortunately familiar way to reduce increasing psychic excitement. Such situation is defined by us as evident drug addiction, and accompanying personal changes are defined as alcoholic encephalopathy, convulsions, hallucinatory delirious disorders and so on. Considering the above mentioned facts, it becomes clear that etiopatogenic treatment of alcohol addiction is impossible without elimination of neurotransmitter imbalance and normalization of their concentrations in the relevant sections of central nervous system. That is why during the first two hours we remove glutamate (N-methyl-aspartate) causing most negative symptoms determining alcohol addiction. This helps our patients to return to normal lifestyle approximately from the second or the third day. After that we administer medicines restoring other biochemical disorders, some of them are shown on the scheme above (endorphine, dopamine, serotonin levels are regulated). As a result, a person begins to feel as he or she was 10, 20, 30 years ago. As it had been before he or she became addicted to alcohol. He or she feels himself or herself perfectly healthy. And to be more precise he or she becomes absolutely healthy. Modern science development does not allow the Clinic to examine the patient’s DNA and thereafter select medicamental treatment. Those who claim such knowledge show disrespect to dependent persons and their relatives. It cannot be 7, 27 or 47 “typical” brain biochemical disorders. Such and similar phrases indicate lack of knowledge in the brain biochemistry and physiology. 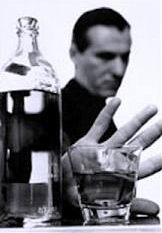 ANONYMITY: we carry out anonymous alcoholism treatment. Jacob Hiller’s alcoholism treatment methods were successfully implemented in Switzerland, Spain, Italy, Austria, Germany and other countries. Come to Doctor Hiller’s alcoholism treatment Center in Moscow – we know how to help you in the right way! Look through the document certifying the acquisition of Doctor Jacob Hiller’s patents for alcoholism treatment and other dependencies treatment in the major NASDAQ auction exchange by American firm HYTHIAM. Thousands of publications proving the scientific justification of Doctor Jacob Hiller’s alcoholism treatment method! Read and make sure. Jacob Hiller: “I am not a psychoanalyst, and I do not want to know why a person started drinking: this fact is of no practical importance for alcoholism treatment. Psychotherapy cannot correct the changed physiology. 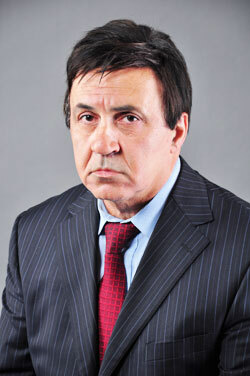 Jacob Hiller, Director of Doctor Hiller’s Clinic, Doctor of Medicine and Doctor of Pharmacology (Switzerland).